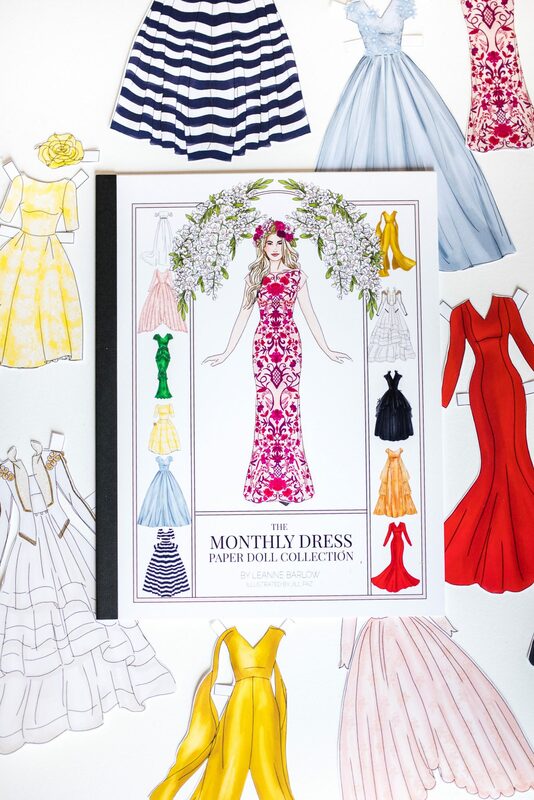 After an entire year of designing and creating a custom dress each month for The Monthly Dress Series, Leanne Barlow is showcasing all of her dresses from The Monthly Dress Series so YOU can see them live and in person! With all 12 gowns on display, this one-of-a kind exhibit is the ultimate Instagram-worthy experience. 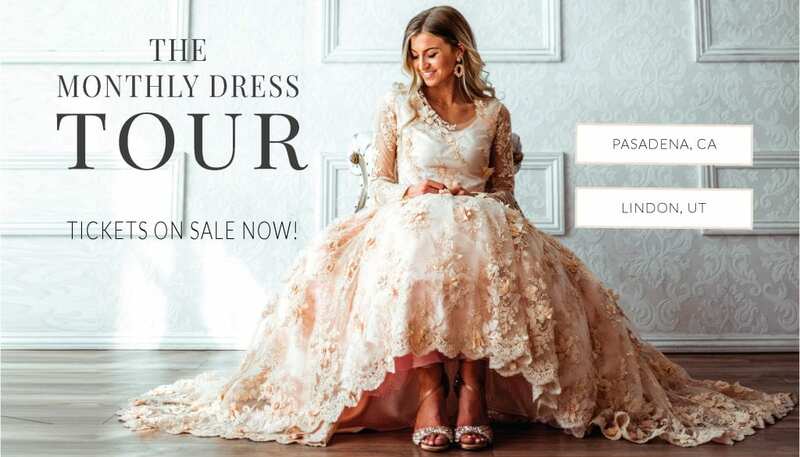 Whether you have followed along with The Monthly Dress Series all year, you are a fashion lover who dreams of the chance to attend a show at New York Fashion Week, or you love the chance to get dressed up and be inspired, join Leanne for an intimate night with all twelve of The Monthly Dresses! 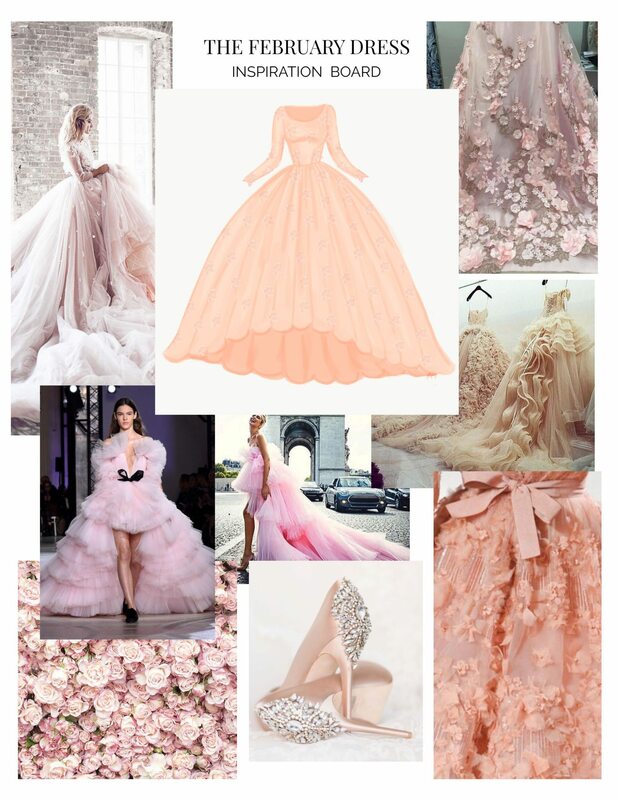 We are so excited be be able to bring these dresses to life for you and Leanne can’t wait to meet you in person. Space is limited and tickets are selling fast, so grab your girlfriends, mom, daughters, or your significant other and get yourself a ticket to one of the most talked about event on social media. 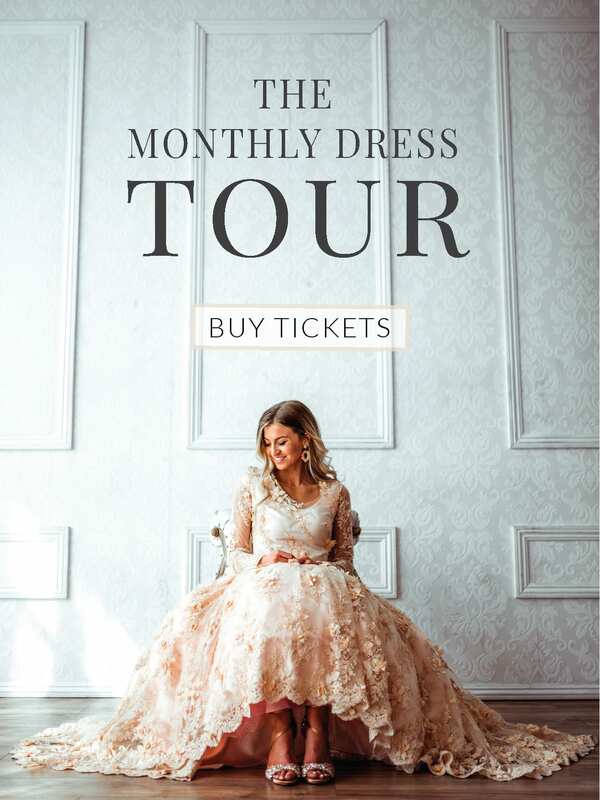 Are you a brand or business interested in sponsoring The Monthly Dress Tour? 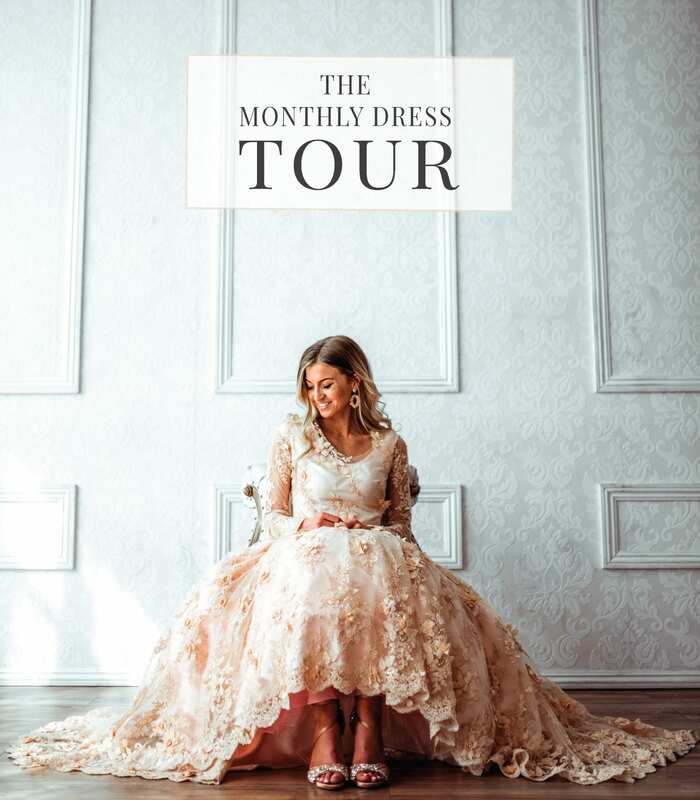 Shoot an email to themonthlydresstour@leannebarlow.com for more information! After passing on the opportunity to compete on Project Runway in order to be home with her 3 young boys, Leanne decided to create her own series on her popular blog, elleapparelblog.com, in order to stretch her skills and creativity that would still allow her the flexibility to be a mom. 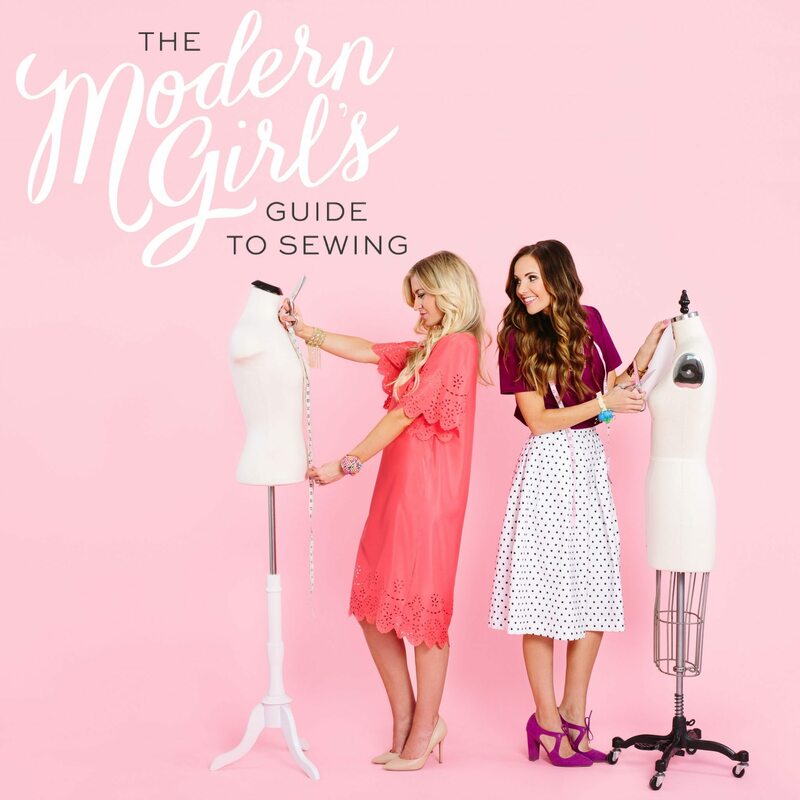 Leanne taught herself how to create clothing 8 years ago after giving birth to her first baby when her husband was in law school and they had no extra budget for new clothing. 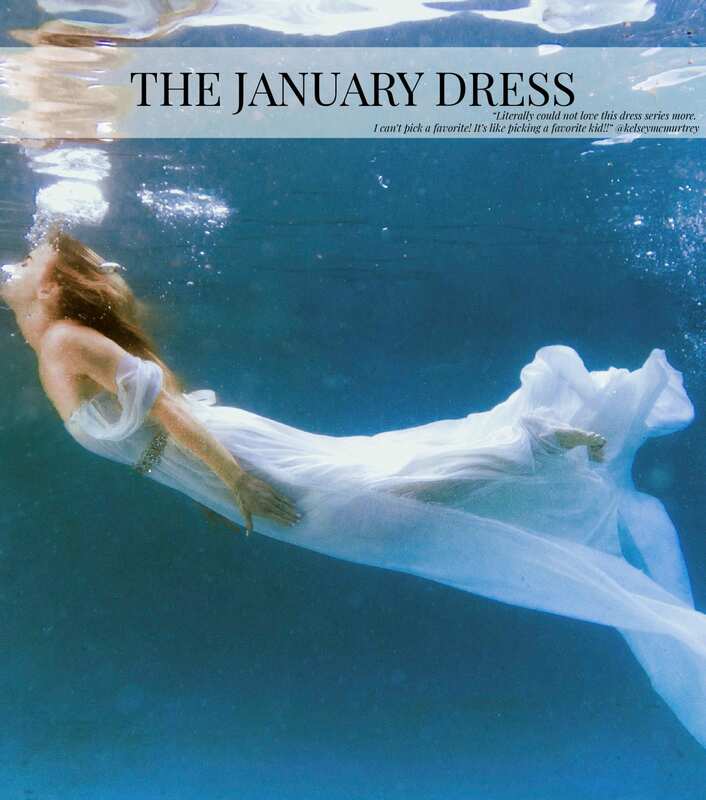 The January Dress. January is a fresh start to a brand new year. 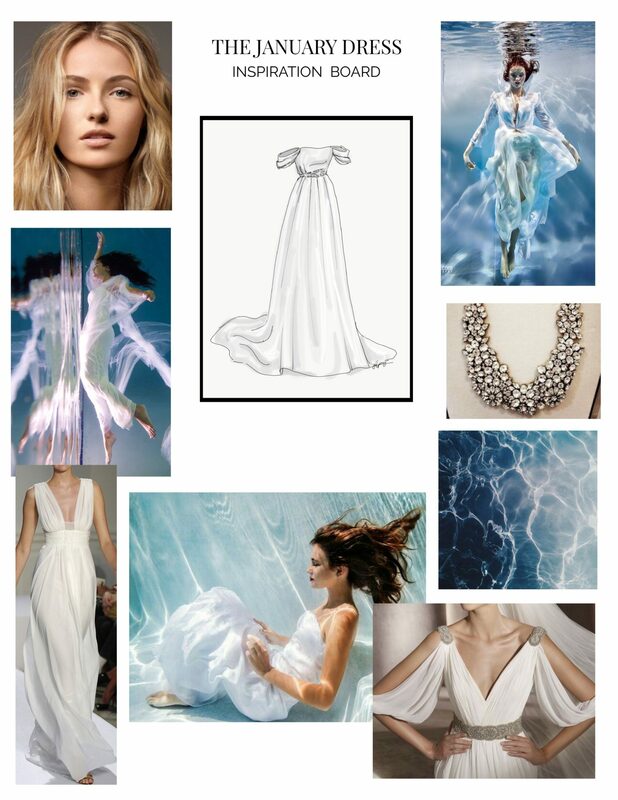 The dress had to be white…and it had to be underwater. January is a time for reflecting on the previous year, and the reflection from the top of the water portrays this. Click here to see all of The January Dress. Watch the Behind The Dress: January episode here. The February Dress. A dress inspired by the love and romance that February brings. A month full of flowers, hearts, love notes, and kisses. 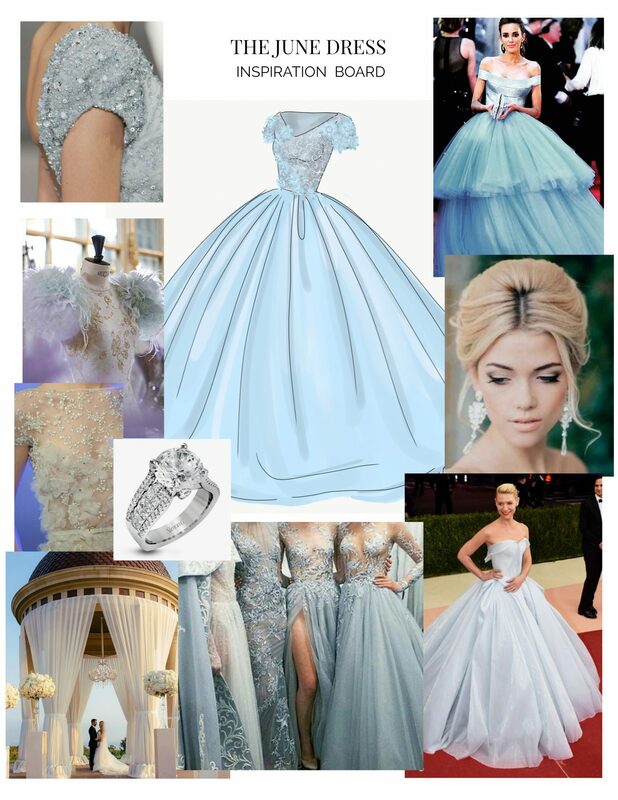 I knew early on that February would be a ball gown. It had to be big and grand and beautiful, but it also needed to be whimsical. 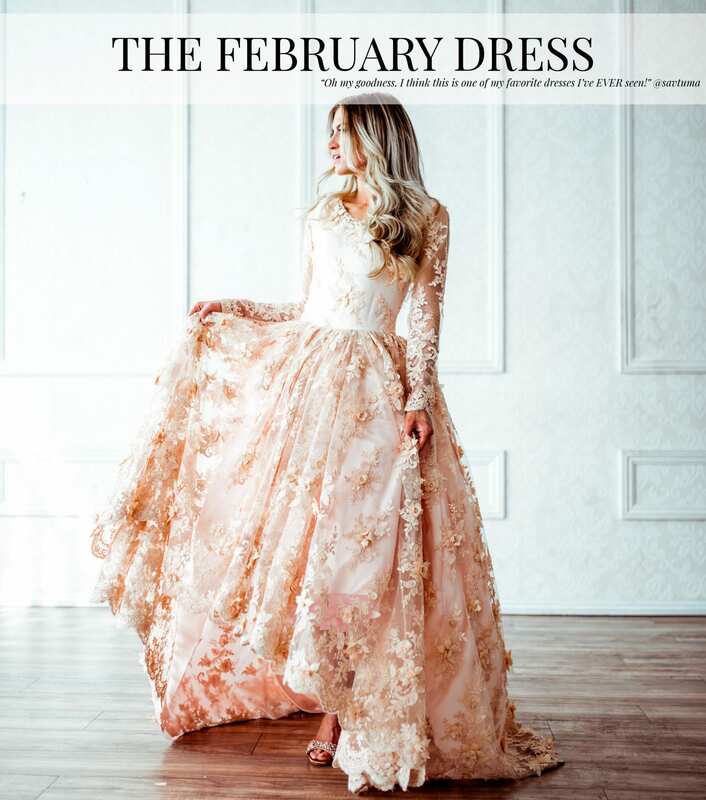 Click here to see all of The February Dress. Watch the Behind The Dress: February episode here. The March Dress. When I looked forward to the Monthly Dress for March, there was only one color this dress could be: a beautiful, true kelly green. I took the image of a field of clovers and morph it into a gown. 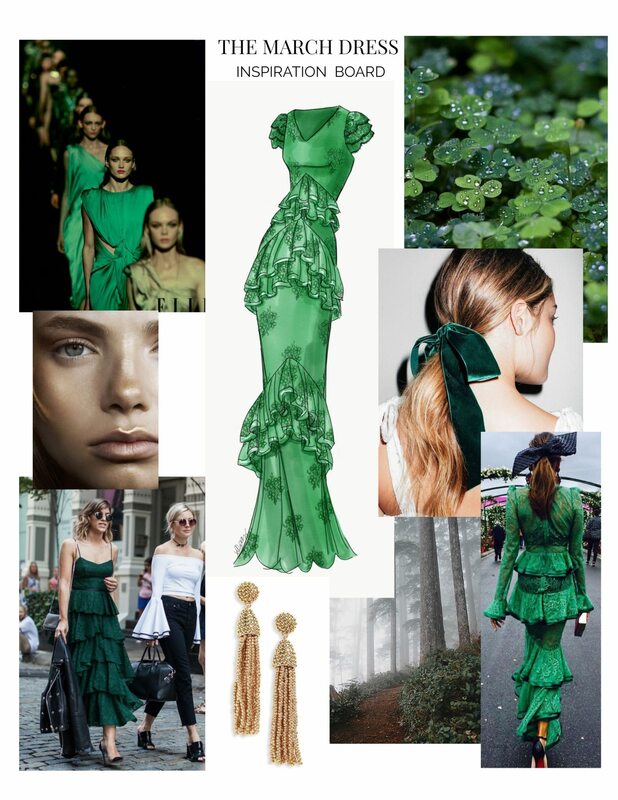 St. Patrick’s Day was my main source of inspiration for this monthly dress. 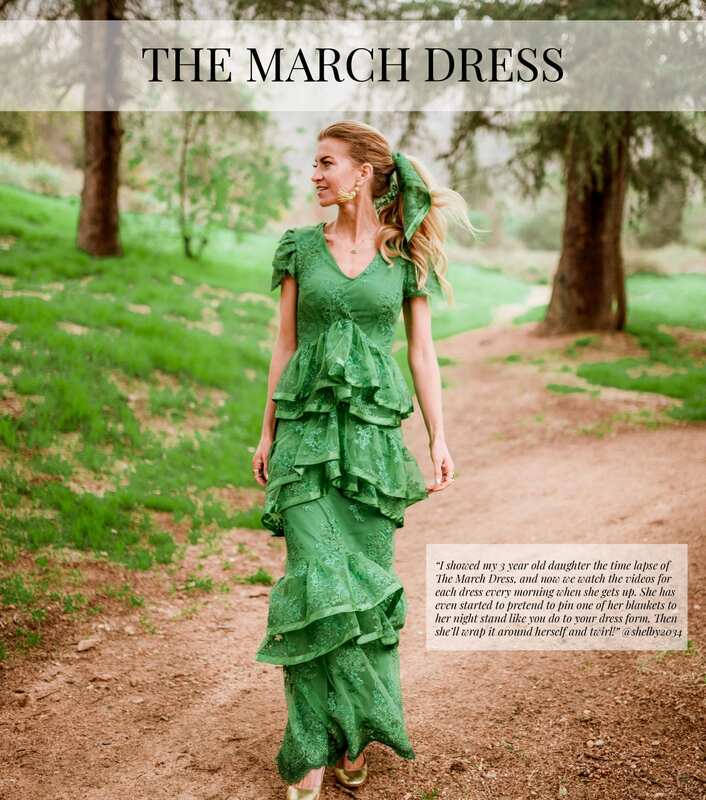 Click here to see all of The March Dress. Watch the Behind The Dress: March episode here. The April Dress. Spring colors are bursting all around me. Trees and flowers and wardrobes are adding pastel pinks, blues, and yellows after a winter of drab. 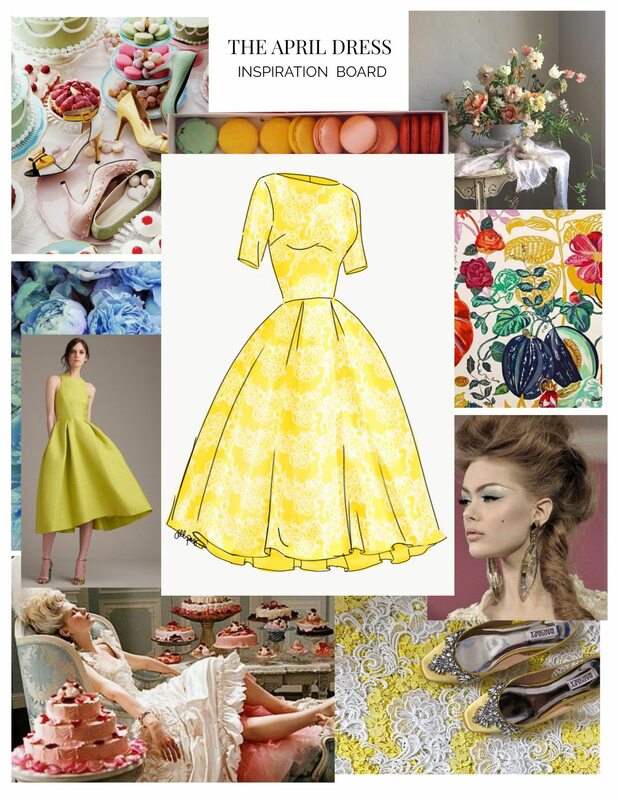 April is the perfect time of year to gather up a bouquet of garden flowers and head to an elegant tea party! 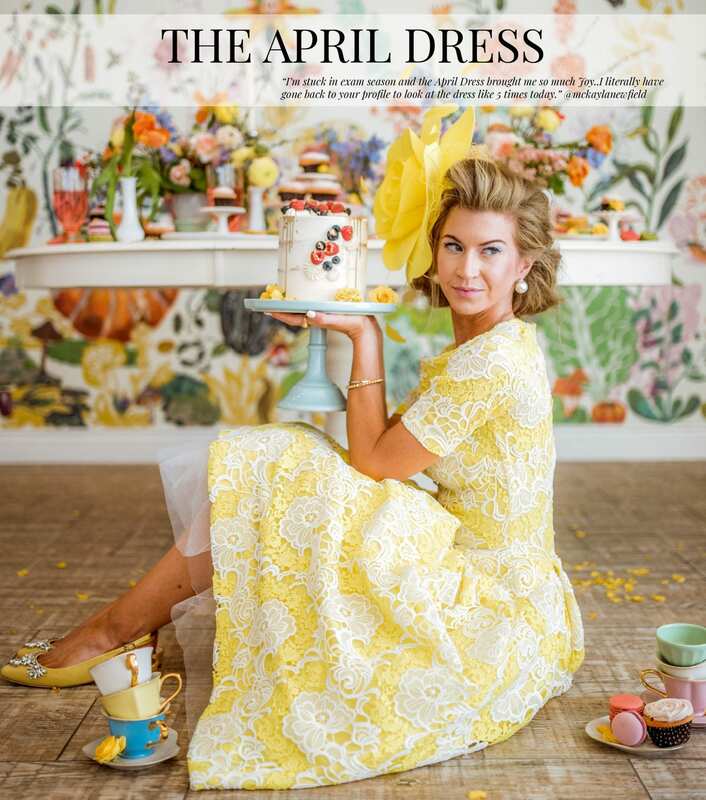 Click here to see all of The April Dress. Watch the Behind The Dress: April episode here. The May Dress. 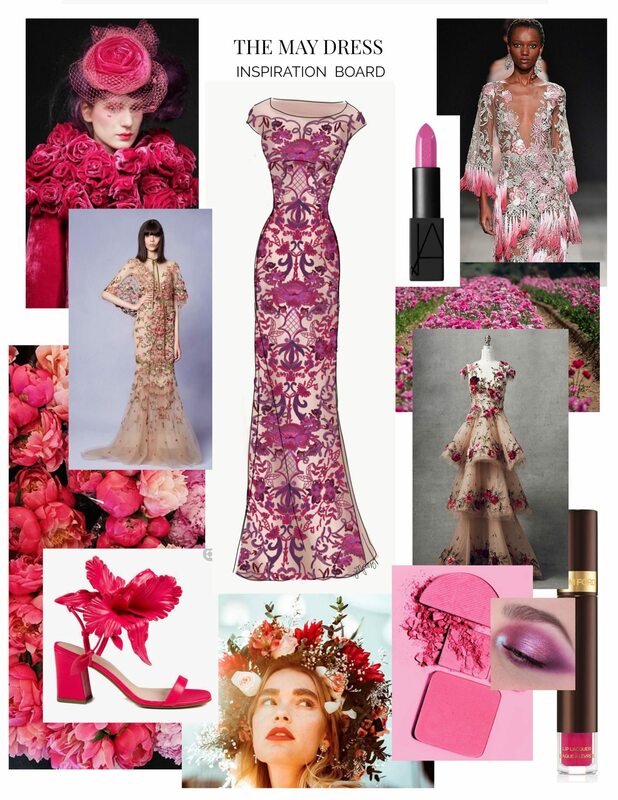 A form-fitting full-length embroidered dress with brilliant shades of fuchsia and orchid melting together in a field of flowers, to give the effect that The May Dress is blooming right from the ground. 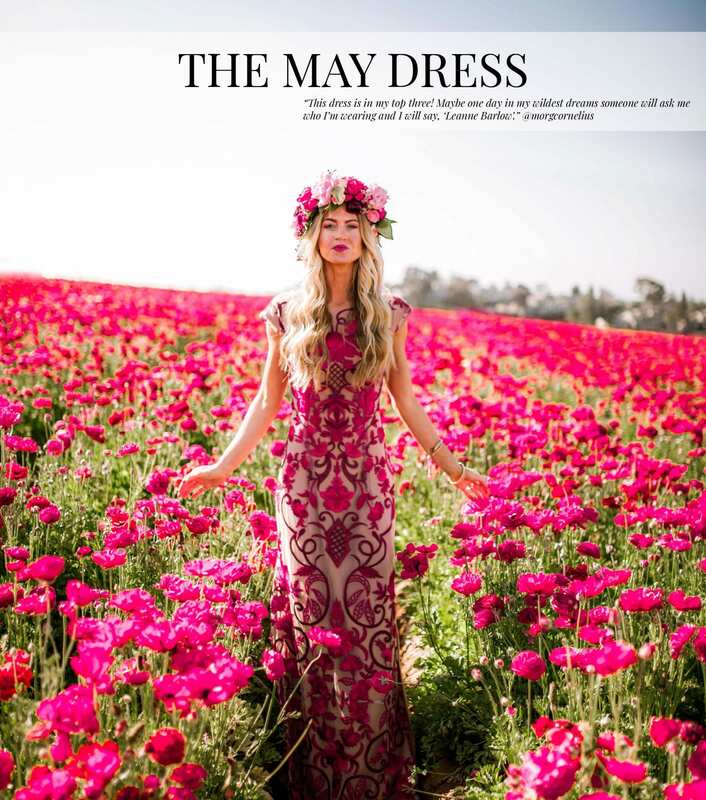 Click here to see all of The May Dress. Watch the Behind The Dress: May episode here. 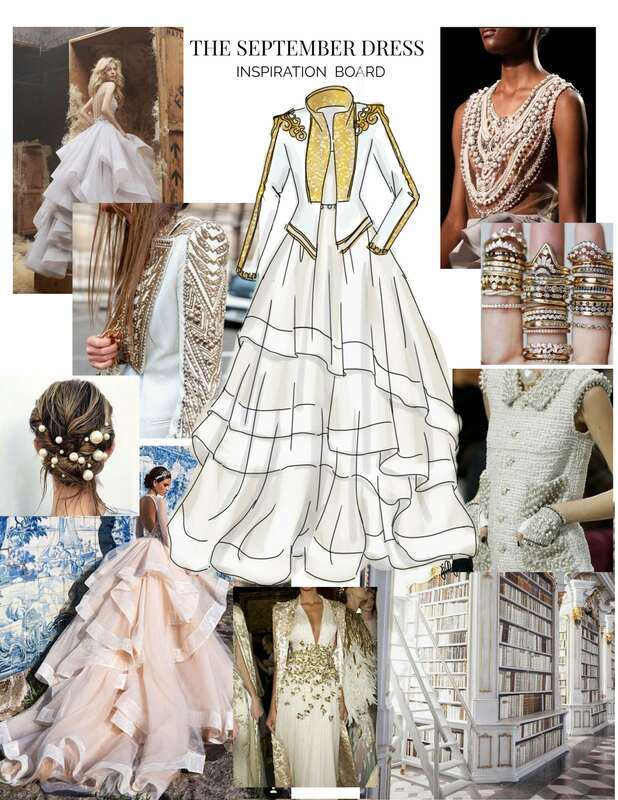 June is traditionally the most popular month to marry, so The June Dress is all about the bride! 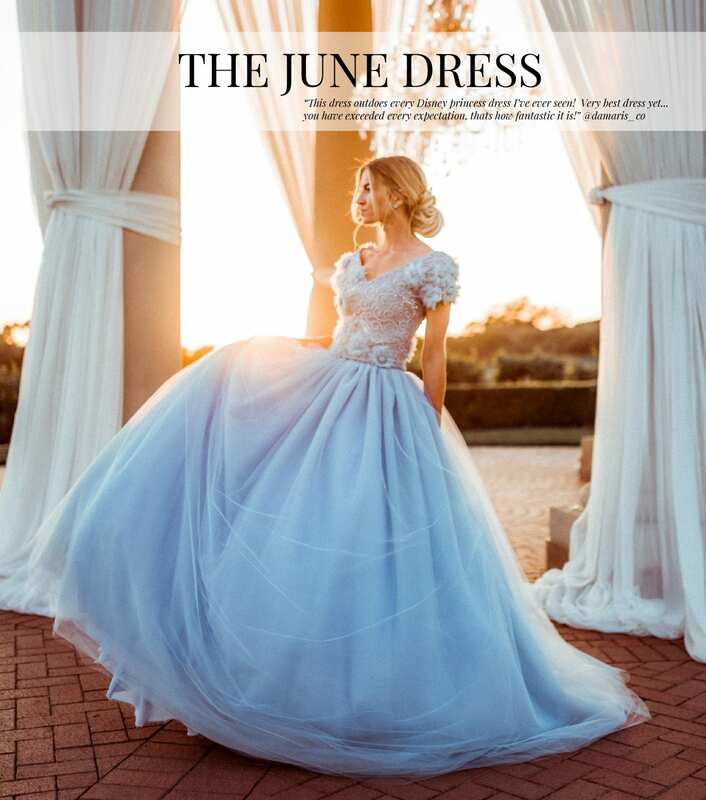 I put my own spin on this dress and created a wedding gown inspired by the old English saying that all brides walking down the isle need ‘something blue.’ Click here to see all of The June Dress. Watch the Behind The Dress: June episode here. July is one of my favorite months of the year! I love getting to celebrate our nation. 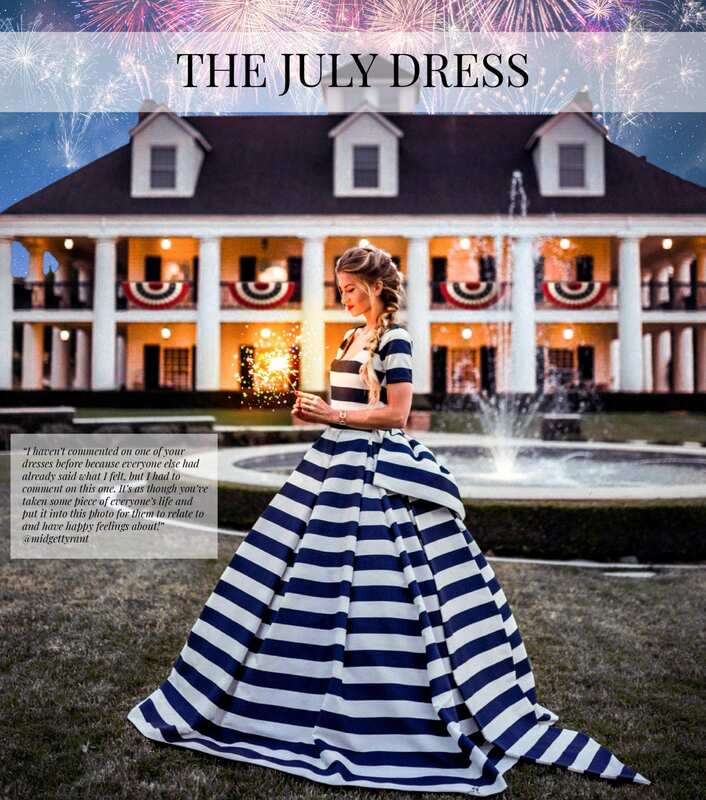 I love feeling patriotic, and I wanted The July Dress to be a bold expression of America! 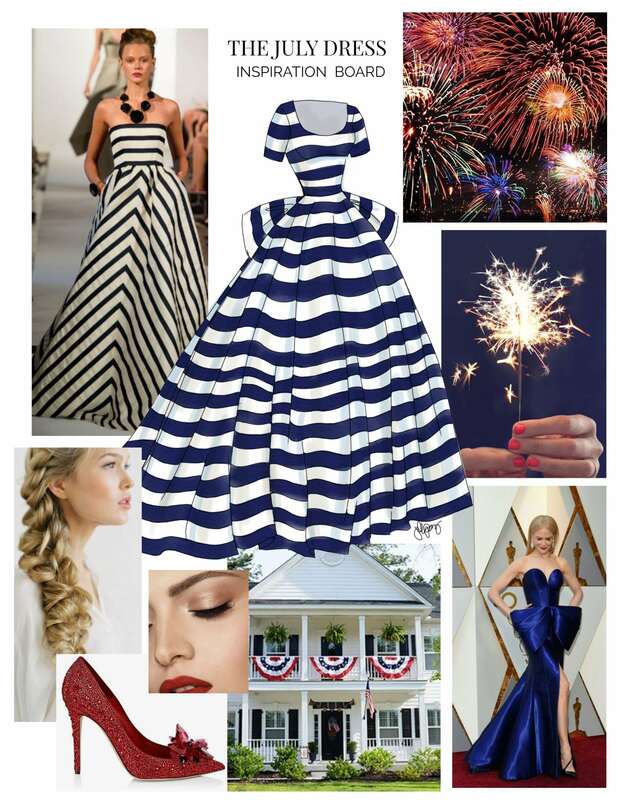 The horizontal stripes on the dress are a nod to the stripes on our nations flag. Click here to see all of The July Dress. Watch the Behind The Dress: July episode here. The August Dress. This dress is all about the HEAT of August. There aren’t any major holidays in August…maybe because it’s just too dang hot to celebrate anything! 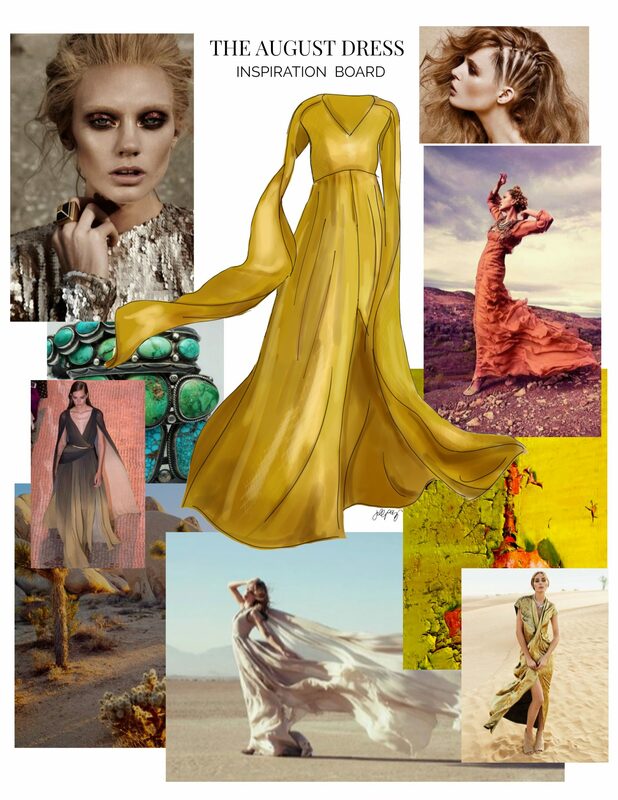 I wanted The August Dress to capture the heat of a scorching desert. 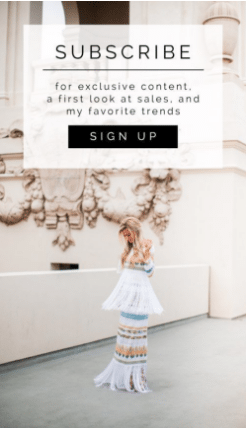 Click here to see all of The August Dress. Watch the Behind The Dress: August episode here. September is fashion month. New York, London, Paris, and Milan host fashion week and Vogue publishes its biggest issue of the year. Vogue’s September issue is legendary–it sets the tone for the fashion world. It’s takes clothing and makeup and hair transforms them into art. 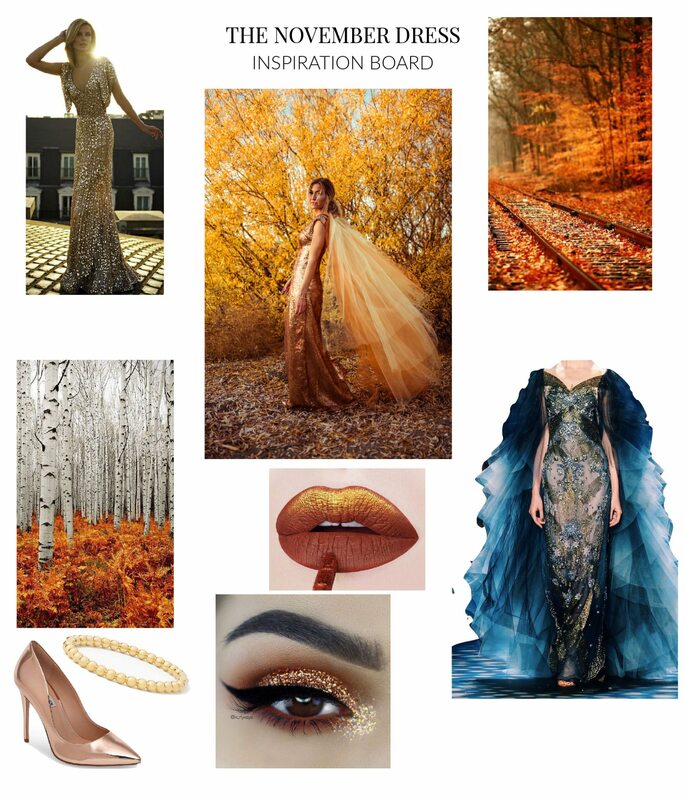 Click here to see all of The September Dress. Watch the Behind The Dress: September episode here. 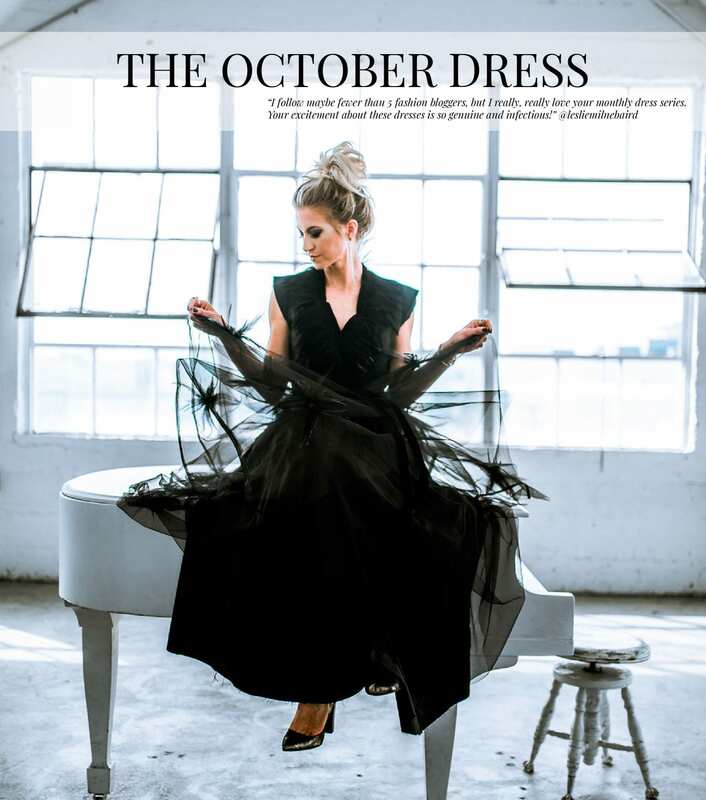 The October Dress: a dress inspired by the dark, eerie month of October. I added multiple layers of tulle on the bottom section of the gown, and added a structured tulle double overlay shorter skirt on top to create a full dramatic silhouette. 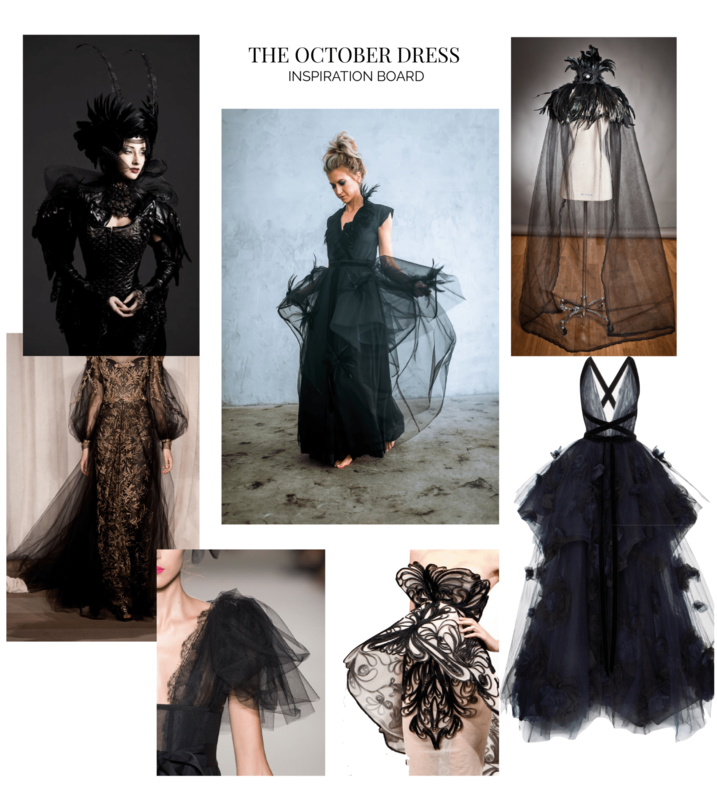 Click here to see all of The October Dress. November. I wanted this dress to evoke the feeling of fall. I wanted it to capture the golden glow of the sunlight hitting orange and yellow fall leaves. There were a few different color pallets I could have gone with to incorporate changing leaves, but quickly settled on a light yellow that melted into a burnt sienna. 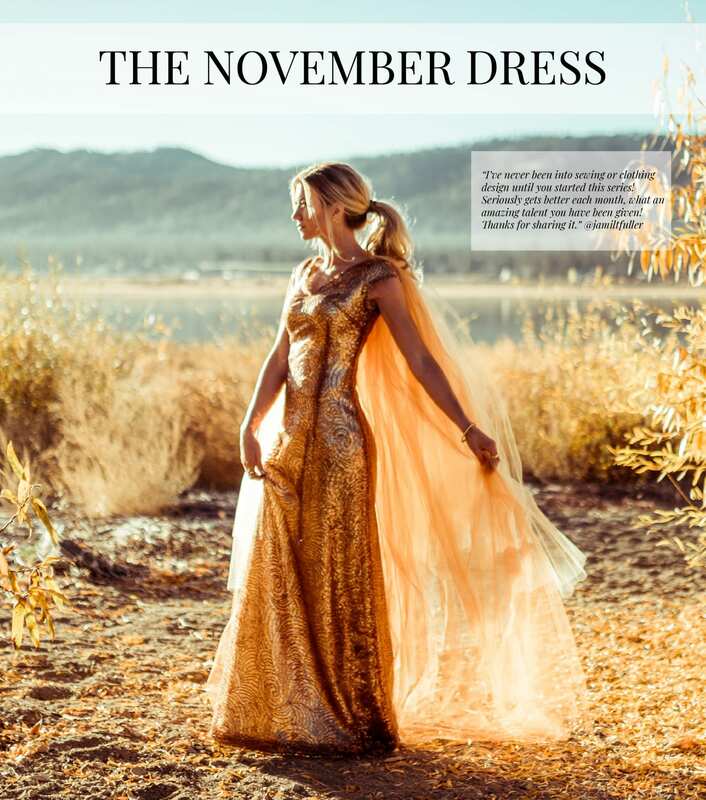 Click here to see all of The November Dress. 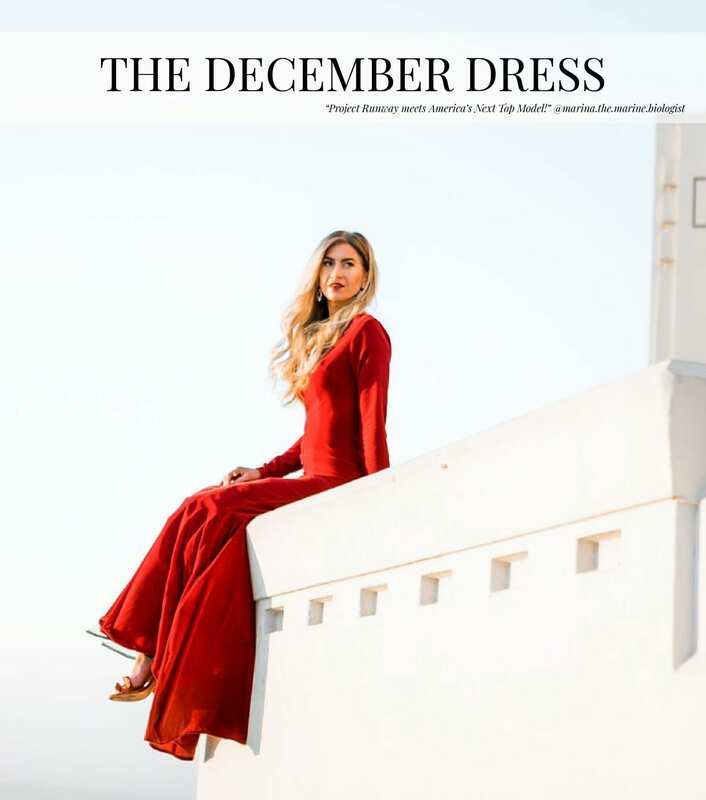 The December Dress! Inspired by the magic and wonder that comes with the month of December, I knew this dress needed to pack a punch. This month I wanted the drama to be in the fabric, so I went with clean simple lines in a form fitting silhouette with a full mermaid skirt and back train. 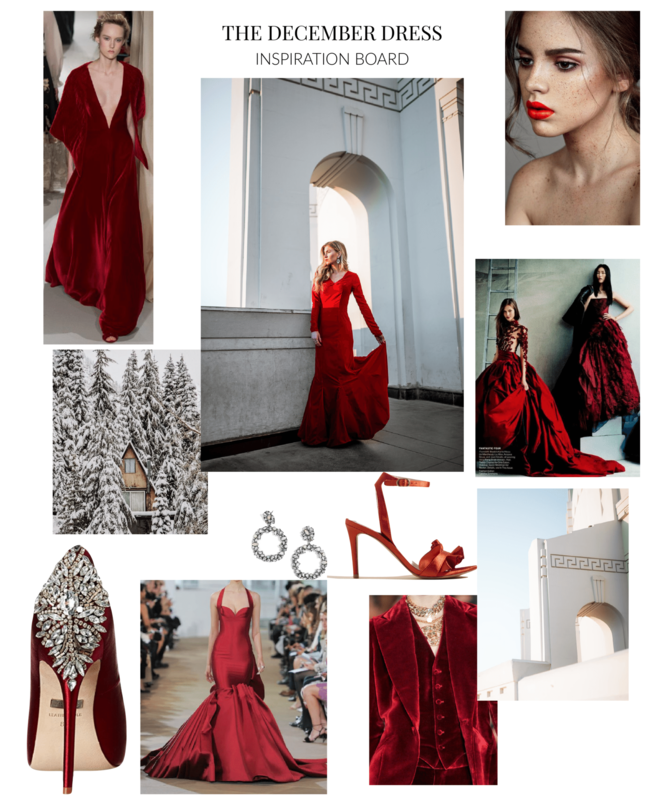 Click here to see all of The December Dress. 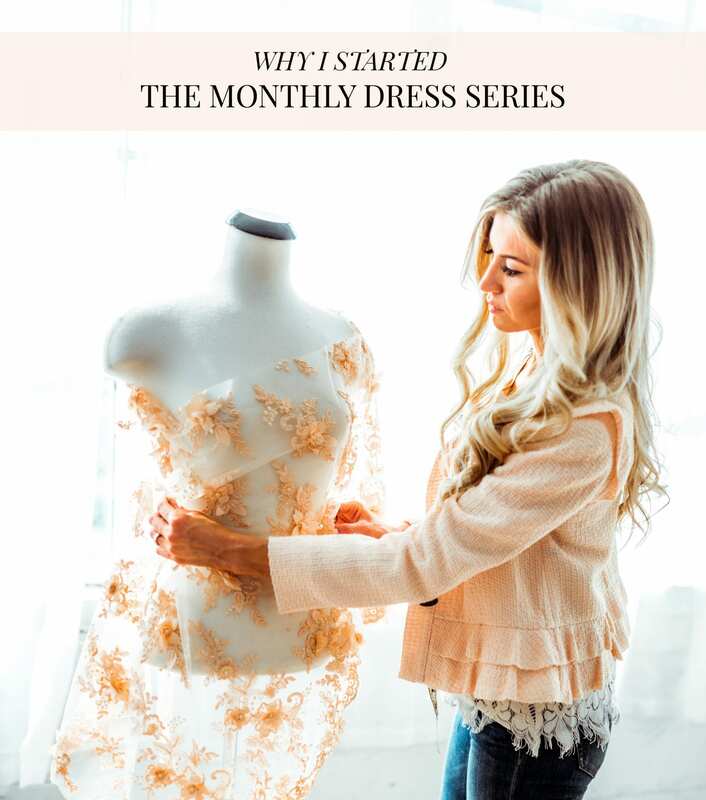 After an entire year of designing and creating a custom dress each month for The Monthly Dress Series, I’m showcasing all of my dresses so YOU can see them live and in person! With all 12 gowns from The Monthly Dresses on display, this one-of-a kind exhibit is the ultimate Instagram-worthy experience. 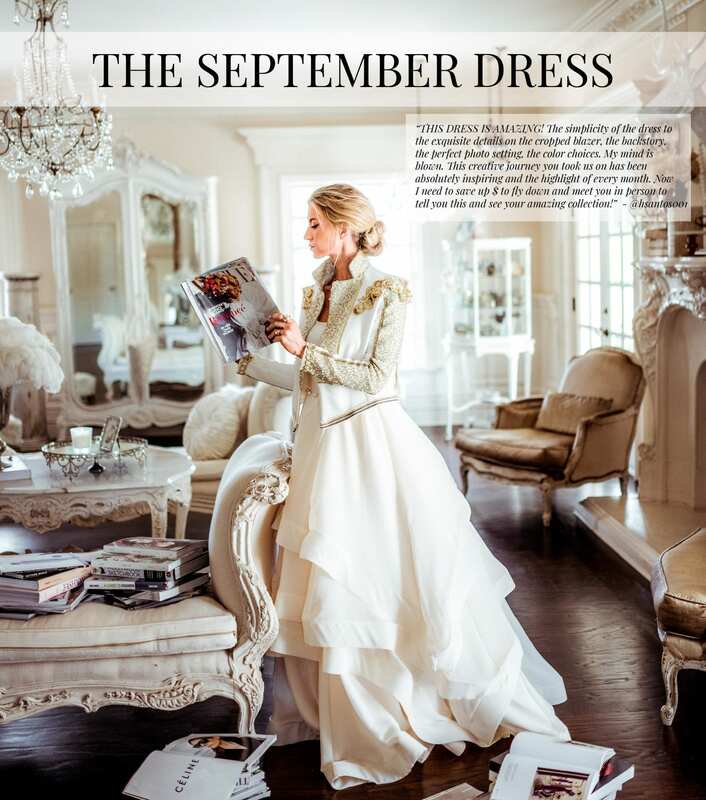 Here is what readers are saying about The Monthly Dress Series..